Well, this is scary. The head of artificial intelligence at Facebook now says the social network’s experimental facial recognition technology is so advanced that it can read other clues in photos to recognize individuals. In other words, Facebook’s technology no longer needs to see your face to know you’re you. As of now, the experimental Facebook algorithm can correctly identify people using these cues the vast majority of the time. In a test using 40,000 Flickr images, the recognition technology correctly identified people 86-percent of the time. This is obviously alarming if you like basic rights like privacy—not like you had much protection from facial recognition technology anyways. 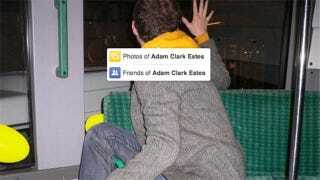 Now if someone took a photo with you in the background, Facebook could ostensibly identify and locate you. Facebook’s facial recognition software was already “approaching human-level performance.” Now it sounds super human. So good luck hiding from Facebook—because you literally cannot hide.